Shana is currently the Director of Hustle & Heart Sports, which runs clinics and leagues in Long Island, NY throughout the year. She is the girls sports pro in Camp Morasha. She is also the Director of the 5 Towns Girls Soccer and Basketball Leagues. Along with running JV Elite Basketball camp, Shana worked as the sports pro in Camp Mesorah, ran the basketball program at Hillel Day Camp and coached the Varsity girls basketball teams at Central and HANC. Shana has been involved with competitive sports since 5th grade at Manhattan Day School, where her single game scoring record in basketball still stands. During high school, she played Varsity basketball at SKA where she never lost a game. She was a 2 time league MVP and a 2 time tournament MVP at the Boca Yeshiva High School tournament. Shana also played AAU and Maccabiah basketball during her high school years. Coach Kristin is currently the Head Varsity Women’s Coach at the Frisch School. Along with coaching at Frisch, Coach Kristin coaches at two prominent AAU programs, one located in New York City called Mo Motion Inc. as well as The Bergen Broncos located in New Jersey. She also heads our coaches and drills at our Hustle & Heart end of summer basketball program in Camp Morasha. Coach Kristin is a native of Florida, whose basketball talents brought her to the Tri-State area the summer of her Junior year in college to play as a NCAA Division II level athlete. She has coached at many different levels. Coach Kristin’s outlook on basketball is if you start from the basics and build off of that with a lot of repetition and consistency, you will start to see your skills and knowledge of the game increase dramatically. Coach Kristin is a School Social Worker where she provides counseling to students with psychiatric and behavioral disabilities. Coach Kristin enjoys working with students and athletes from all walks of life. Coach Chad is the Athletic Director at Hebrew Academy in Miami Beach. He also coaches the 5th grade boys team who has won back to back championships. He was the 2005 Gatorade Player of the Year in division 5A and was nominated for the McDonalds all American game in High School. He finished the 2004-2005 year ranked in the top 30 in the state of Florida. Chad attended Barry University on a full basketball scholarship. Chad has been involved in basketball for over 20 years and brings his basketball knowledge as a division II player and Hebrew Academy coach to teach and improve each player's skills and fundamentals. Alana lives in Hollywood with her husband and 2 kids. She is running a fundamentals basketball clinic for girls in Hollywood over the summer. Alana coached HANC JV and Varsity Girls High School teams and was a Yeshiva League Basketball Star in High School at HANC. She still plays in a Women’s weekly league in Hollywood. She currently works as an OB/GYN Ultrasound Technician. Alana brings her basketball knowledge and years of playing and coaching experience, to teach the campers how to play the game the right way based on fundamental and proper skill development. Mallory is currently the Assistant Athletic Director at Hebrew Academy. Over the past 5 years at Hebrew Academy, Mallory has coached the girl's varsity, girl's middle school, and girl's elementary school basketball teams. Before she moved to Miami, Mallory coached travel basketball for the Kaneland Silver Stars program in Illinois. She also ran a k-5 summer basketball day camp at Kaneland High School. Mallory graduated from Northern Illinois University with a Bachelors in Kinesiology and Physical Education and Health. She played college softball and was a pitcher for the Lady Huskies. She also coached softball at a local high school while finishing up her bachelor's degree. We are excited to have Mallory in camp as we know she will bring her love of the game, her warmth and enthusiasm to improve our players. Coach Steinmetz is the Head Basketball Coach at Yeshiva University (yumacs.com). 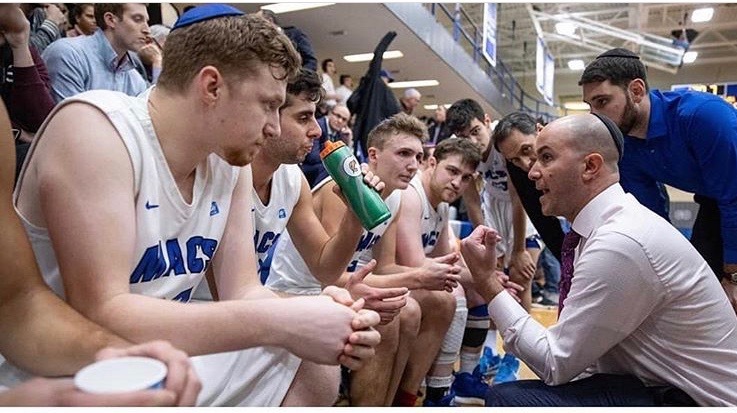 He is responsible for overseeing all aspects of the Yeshiva University men's basketball program. In his four years at the helm, Steinmetz led the team to four straight appearances in the Skyline Conference Playoffs. In his third year, the Maccabees won the Skyline Championship, a first in YU history. He coached five players who were named Skyline First Team All-Conference plus three Skyline Rookie of the Year. In 2016-17, Steinmetz was voted the Skyline Conference Coach of the Year. He won championships as head coach of the varsity basketball teams at both North Shore Hebrew Academy High School and Hebrew Academy of Nassau County, and coached the gold medal-winning United States 18 and Under Boys Basketball Team for the Maccabiah Games in Israel. Coach Joe is the Head Coach for the Hebrew Academy Girls Basketball team and the Athletic Director at the Miami Beach JCC. He also started and runs the Miami Beach Elite Travel Basketball program. Coach Joe has been coaching basketball for over 25 years for all ages. He plans to bring his passion for teaching the game and making young people better when he joins us as a Guest Coach. Jeff is a freshman on the Yeshiva University Mens Basketball team. In his first season, he averaged 11 points per game with a 53% field goal percentage. He attended Northwest Yeshiva High School in Seattle for Freshman and Sophomore years where he was named All Conference 1st team both years. He and his family then moved to Memphis where he played for the Margolin Hebrew Academy.